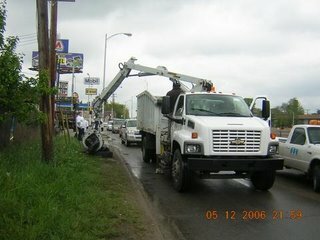 As promised earlier, here are a few photos from the Motor City Make Over. All of them are courtesy of Jenn Ruud with Detroit Synergy since I didn't have my camera with me that day. 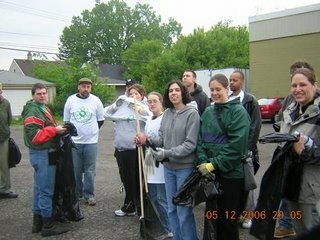 To recap the events of last Saturday, a team of 23 volunteers came from as far away as Ann Arbor to take part in Detroit Synergy's Project Clean. They were joined by folks from the Warrendale Community Organization as well as a brief appearance by State Representative Gabe Leland. They picked up 71 bags of trash along the southbound Southfield Freeway Service Drive, from Joy Road to Paul. They also cleared away 19 scrap tires and trimmed branches that were blocking the sidewalk. 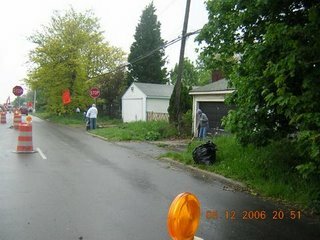 When they were done, the good folks from DPW came by with their trucks to cart everything away. As a personal note, I have to admit that I get a strange thrill from watching those big pieces of equipment do their thing. When they were done, the crew from Detroit Synergy went to the Dog House Coney Island for lunch; followed by drinks at Chick's Bar - making it the perfect Warrendale experience for them.